It’s A Tradition With Us, Mister! 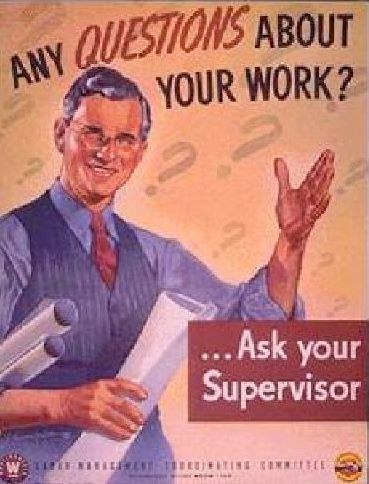 Any Questions About Your Work? This entry was posted on June 2, 2009 at 3:15 pm	and is filed under MILLER J. Howard. Tagged: Illustrator, J. Howard Miller. You can follow any responses to this entry through the RSS 2.0 feed. Both comments and pings are currently closed. grande Geraldine, l’amica di Rosie. In realtà lei non è né Rosie né Geraldine. Lei è Obama truccato. Le locandine di propoaganda durante la guerra mi son sempre piaciute un sacco. Soprattutto queste che ricordano il ruolo fondamentale delle donne nel tenere in piedi l’industria statunitense, la grandiosa macchina che ha permesso di vincere la guerra. Di questo Miller si sa ben poco, tranne appunto che lavorò per la Westinghouse e realizzò alcuni manifesti di propaganda durante la Seconda Guerra Mondiale. Sempre a proposito del ruolo della donna nella società americana ho un altro suo manifesto dove alle spalle della donna operaia degli anni bellici si staglia l’immagine della donna della Frontiera, intenta a caricare il fucile. Non l’ho pubblicato perché è in dimensioni un po’ troppo piccole. 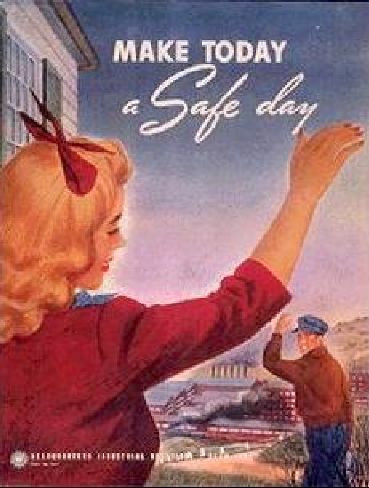 Oltre a questo famosissimo “We can do it!”, di Miller, per il momento, non posso pubblicare nient’altro. Does anyone know where J Howard Miller was born and the date. Similarly where and when he died. Pat, I don’t know if you’ll still get this message or not, since its about 3 years since you posted, but if you do have the stationary, I would be really interested in buying it from you if you would be willing to sell it. J. Howard Miller was actually my mom’s uncle. Unfortunately she used all his note cards and stuff years ago when we were kids. You used to be able to find them in Hornes and Gimbles, things like that when were were kids, but I haven’t seen them in years. When I graduated in 1983, Uncle Howard gave me a set of all his prints, the ones that were used to make those cards and I would love to find a set of cards. Please contact me if you still have the cards and would be willing to part with them. Its purely sentimental on my end. My mom is now 82 and we have been doing a lot of reminiscing and I would love to show them to her. Thanks. Hi Sara I recently bought a pair of J. Howard Miller sketches from an auction in florida. One is of Ligonier Town Hall and the other of a park gazebo with what looks like a church in the background. Both are framed and are in fine quality. I believe them to be prints but not sure. They have stickers on the back that say Hills Gallery Perrysburg Ohio. I looked it up and can’t find it. I’m not sure what they’re worth but would like to know. I can only find one other sketch of his on the internet of Pittsburg. They seem rare. Dimensions 12×9″ in 14×17″ frame. Any info would be great thanks! Not sure of the worth of any of his prints. Besides the ones that Uncle Howard gave me when I graduated, the others I have picked up really fairly cheap, usually between $20 and $30. I don’t believe I have the two that you are mentioning, would love to see pictures of them. If you’re interested in selling them, I might be interested. Please let me know. Thanks for the information regarding where they came from. I may try to track them down to see what all they can tell me about them and to see if they still have any in their possession. You said you picked these 2 up in Florida at an auction? Just curious, if you see any others at some time from a Thomas Miller, that would be Howards younger brother (my other Great Uncle). Thomas Miller did mostly oil paintings. He and my Aunt lived in Florida for several years and once she passed there was a lady that lived with him and she sold or took all his paintings when he passed. My mom was hoping to get one when she spoke to her, but the only painting she would give my mom was of some random guy that we have no idea who it is. LOL But some day I’m hoping to find some of his paintings to go with others that I have that he had given my grandfather which are really really old. If interested in selling the two you have from Howard, please let me know. I was wondering if anyone knew anything about a series of pictures that we recently came across. There are 6 pictures all together all of different historical spots of Pitt. Three Rivers Stadium, Civic Arena, Fort Pitt Blockhouse, Old North Side Post Office, The Incline, And the Cathedral of Learning. We have all 6 and are still in perfect condition just found them in the back of a closet in an old house. If someone could e-mail me and let me know Id appriciate it angel_25_17@yahoo.com and my name is Sarah! Thank You! I’m trying to find out who owns the rights to J. Howard Miller’s work. Do you know if he had any relatives? I can’t find out much about him on the web. J Howard Miller. Some are from 1972 and some from the 1950’s. do these have value? pretty sure he passed away in 1987, before his poster became really famous. For those of you that are interested in information about J. Howard Miller, I am a relative of his. My grandfather on my mom’s side was Howard’s brother. I may or may not be able to help with any questions, as my mother is probably one of the few relatives left. Feel free to contact me if you have any questions. Whether any of his pictures are really valuable or not, I don’t really know. I have purchased a few very reasonably priced over the years, and have a set that was used at the printers. I would love to find some of his note cards if anyone would be willing to part with them. Thanks. 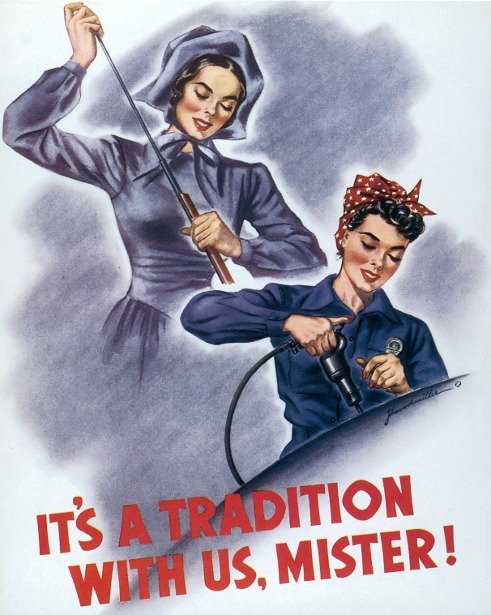 do you know if the picture Rosie the Riveter is copy righted? We would like to use this image for our company and needed some information. I’m sorry I can’t help you regarding whether it is copyrighted or not, but I do know that when you look down in the bottom left hand corner that there is a Registered symbol, but I don’t know about the legalities of that. I would assume that since he did the picture for Westinghouse originally that it is. I’ll see if I can find out anything for you. I work for an image library and we have few images of Miller’s posters. If you can track down the copyright holder for Miller, I would be extremely grateful if you were to pass that information to me as well. I know the picture was original done for Westinghouse, so I assumed they held the copywrite, but that may or may not be the case. One of these days, I’m hoping to find a nice print of the poster for myself. It would be nice to have one since I have several of his watercolors of Pittsburgh. His brother, Thomas Miller, was also an artist, so I’m looking to see if I can find any of his also. Please let me know if I’ve been able to help you at all. It is my understanding that he lived and died in Evart, Mi. Is this true? Was he born here and attend school here in Evart? If not, what brought him to live out his last days in Evart, Mi? Suzay, I have come across 4 prints of paintings by J Howard Miller of Scenes of Pittsburgh. I have Three Rivers Stadium, The Civic Arena, the Old North Side Post Office, and the Fort Pitt Blockhouse. They measure 12.5″ X 13″. They were sold to benefit the Allegheny County Association for Retarded. My mom purchased them in September of 1973. Would you know of anyone who may be interested in them? I may be interested. If you still have them, please let me know. I’ve been collecting some of the prints when I can since J. Howard Miller was my great uncle. Depending on which exact ones you have, I may purchase them from you. Thanks. I found a large hand painted thank you picture framed that I think howard miller painted for a doctor he visited in Punxsutawney in the late 1960’s ire early 1970’s. Oh that is cool. if you have a chance, can you post it or send me a picture of it to my email? My personal email is sarah4watkins@yahoo.com. I’d love to see. Did he sign it?